I hope your Yom Kippur was as special, prayerful and divine as ours. Now we are in full swing with the exciting Sukkot preparations. I look forward to the seven days of Sukkot holding the lights of our holy Uspizin (our Patriarchal Sukkot guests). Each day we have the opportunity to tune into and connect with respectively Avraham’s light of Chesed (loving/ kindness), Yitzchak’s light of Gevurah (restraint), Ya’acov’s light of Tiferet (balanced beauty), Moshe’s light of Netzach (endurance), Aharon’s light of Hod (majesty), Yosef’s light of Yesod (foundation), and David’s light of Malchut (royalty). 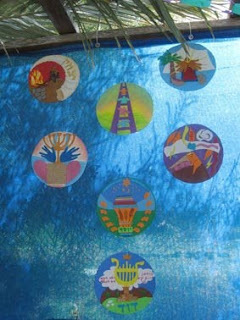 It is good to be mindful of these special energies, available for us to tap into each day of Sukkot. I have learned from my spiritual healing teacher Chana Luke that at this time, as we have just emerged from Yom Kippur, we are so renewed and holy that our brachot are quite powerful. Let us take the opportunity to bless each other at this time. I bless you with Simcha (happiness), Wisdom, Energy, Inspiration and Shalom! May You Dwell in the Sukkah of Hashem! Let me begin with a parable: Sarah who is almost five has her eye on a $1.99 custom made pearl-necklace. She counts her pennies and saves up; when she finally is able afford buying this necklace, she is so excited. She wears her new necklace day and night and it makes her feel big and special. Every night after the bed-time story her father asks her “do you love me?” “Of course I do,” “Then give me your pearls.” “Oh, Daddy, not my pearls! You can have princess, the white horse from my collection, the one with the pink tail. Remember, Daddy? The one you gave me. She’s my very favorite.” “That’s okay, Honey, Daddy loves you. Good night.” As always, he brushes her cheek with a gentle kiss. About a week later when her Daddy comes in, Sarah is sitting on her bed with her chin trembling and one silent tear rolling down her cheek. “What’s the matter Sarah?” Sarah doesn’t say anything but lifts her little hand up to her father. When she opens it, there is her precious pearl necklace. With a little quiver, she finally says, “Here, Daddy, this is for you.” With tears gathering in his own eyes, Sarah’s father reaches out with one hand to take the dime store necklace, and with the other hand he reaches into his pocket and pulls out a blue velvet case with a strand of genuine pearls and gives them to Sarah. He had them the whole time ready for her. He was only waiting for her to give up the dime-store stuff so he could give her the genuine treasure. So it is, with our Heavenly Father. He is waiting for us to give up the cheap things in our lives so that He can give us beautiful treasures. Simchat beit Hashoevah is such a Divine treasure as it states: “He who has not seen the rejoicing at the place of the water drawing has never seen rejoicing in his life. Following the first day of the holiday they would go down to the women’s courtyard and rectify a great rectification...” (Babylonian Talmud, Sukkah 51a). Why was Simchat Beit Hashoevah the greatest joy ever? What is this great happiness connected specifically with water? Why did the water sacrifices take place in the women’s courtyard and what is the great rectification done through Simchat Beit Hashoevah? Water is the pure eternal substance, preceding even creation. Its purity is beyond time. When the earth was destroyed during the flood, the water remained. Water is compared to teshuvah, (Bereishit Rabah 2:4), as it states: “Pour out your heart like water” (Eichah 2:19). After Yom Kippur when we returned in complete teshuvah to G-d, and have liberated ourselves from our evil inclination, we pour water on the altar with complete exhilaration. This ritual brings us to the core of life, since 75 % of our being consists of water. As everything rises with the water, we now cleave to our root – the Life of the Universe, realizing that everything is from G-d – we have nothing of our own. Water is a symbol of unconditional love. It is totally pure and simple in itself. Water embodies the great love Hashem showers upon us, every moment of the day. Although wine can become impure by contact with gentiles, water remains eternally pure for all mankind. It requires no effort in planting, reaping, processing, or purifying. Hashem accepts the water sacrifice, the same way He accepts the wine sacrifice, which does require all the processes of preparation. Since G-d’s love for us is unconditional, both wine and water are equal in His eyes. The connection between G-d and humanity is highlighted through the water with which G-d blesses the earth in response to our actions. G-d willed it that humanity complete and perfect creation by causing the water to flow. “Every plant of the field was not yet in the earth, and every herb of the field had not yet grown: for the Eternal G-d had not caused it to rain upon the earth, and there was no man to till the ground” (Bereishit 2:5). Rashi explains that the reason G-d had not yet brought down the rain, is because [hu]man was not yet created to awaken the rain with his prayer. “On the festival [of Sukkoth] there is judgment over water...Why did the Torah say to pour water on the festival [of Sukkoth]? The Holy One said, pour before me water on the holiday [of Sukkoth] in order that the rain of the year will be blessed” (Babylonian Talmud, Rosh Hashana 16a). Why do the water sacrifices on Sukkoth cause the rain of the entire year to be blessed? The Japanese Dr. Masaru Emoto found that water responds to music, words and prayer. Water crystals are formed in correlation with the energy and consciousness transmitted to the water. Perhaps this explains how the utter exhilaration during the water libations of Simchat Beith Hashoevah would effect the flow of water for the entire year. There is no greater happiness than the reunion of male and female after a long period of separation and restraint. This is the ultimate return to Hashem, the root of creation. It is interesting that it is specifically through the purifying waters of the mikveh, that husband and wife become reunited after the period of separation. Furthermore, it was at the well of living waters that many of the soul-mates of the Bible met. The union of male and female through the water- sacrifices extends to unify all opposites, such as water and fire. These two opposite substances are united in natural salt water. This union of divisions takes place at the Festival of Sukkoth, whose essence is the unification of all Israel in spite of their differences and contradictory elements. Shaking of the Lulav on Sukkoth embodies the unification of the different kinds of Jews represented in the four different parts of the Lulav. At the water-sacrifices there is a union of opposites: The waters from above meet the water from below, in a kiss so pleasant that no greater joy exists. This union dissolves the boundaries of separations, which occurred at Creation. When G-d created the world, He had to constrain His own presence, so to speak, for the sake of the creation of the world. This constraint is called the tzimtzum. The creation process entails numerous separations like the separation of the light from darkness, and the separation of water from dry land. Specifically through water, which mysteriously existed at a primal stage of creation, it is possible to penetrate the tzimtzum and connect with the essence of G-d – the root of all existence. When we unify the opposite elements in creation, through the water sacrifices, we are able to reach beyond the tzimtzum – all the separations of Creation, and reach the original realm of Hashem from before Creation, wherein all contradictions are united. It is the reunification of opposites which enables us to rise beyond the tzimtzum. Opposites are only in the realm of our existence, but in the realm of G-d everything is unified. The reality that the female waters were held back and restrained fits in with women’s position in Jewish life. We women have to hold back our potential to a certain degree for the sake of the family. However, this restraint is not forever endless. Just as the lower waters were promised they would rise with the sacrifices, there will come a day when the diminished moon will grow to become the size of the sun (Yesha’yahu 30:26). At the time of redemption, when we will draw water out of the wells of salvation (Yesha’yahu 12:3), then women, who are compared to the moon, will rise to their full potential. Therefore, it is not by chance that the Court of the Women was chosen as the place for celebrating Simchat Beith Hashoevah. There the female (lower) waters were allowed to be drawn out and fully express themselves. When we women celebrate Simchat Beit Hashoevah, through Torah music and dance for women only, we express the beginning of this redemption process, as we emerge from our restraint for the sake of the mitzvah of Simchat Beit Hashoevah. Although the Temple is yet to be rebuilt and the water sacrifices to be reinstated, our joyous music and dancing is more than just a memorial to what once was and a practice for what will be. Our joyous celebrations are part of the redemption process of the lower waters beginning to rise, and therefore every step of our dance is a step on the way to pouring the waters of jubilation on the altar in the Temple, and celebrating our deepest connection with Hashem. Simchat Beit Hashoevah is the greatest and most joyful gift ever. Since it is the simplest most essential substance, the water sacrifices demonstrate that we have absolutely no attachments to anything in the world, except Hashem. “Vanity of vanities all is vanity” (Koheleth 1:2). Hence, we are not trying to prove our self-worth by bringing animal and wine sacrifices, which require proper preparation and financial means. We have even detached ourselves from our individual Torah knowledge and wisdom, as we stand like naked before Hashem. We all experience total equality, when stripping off our outer layers of selves. Then we are in total tune with our inner common core consisting mainly of the primal substance of water. We are the receivers of the greatest gifts, when we share love and touch others as in the unification of the upper and the lower waters during Simchat Beit Hashoevah.